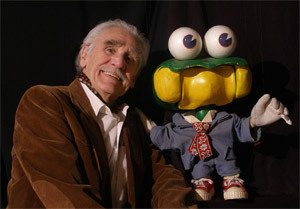 Herb McAllister designed and constructed Froggy Doo as a marionette and introduced him on Halloween. Froggy became so popular that the show was renamed “Happy Herb and Froggy Doo” which aired for eight years in Great Falls. Froggy would appear in a puff of smoke and tease and disrupt everyone and everything thus adding humor and mischief to the show. During the autumn of 1963, KULR-TV in Billings, Montana, hired Herb to perform “Happy Herb and Froggy Doo.” But in October of 1966 disaster struck the Billings studio when burglars broke into KULR-TV and stole thousands of dollars of equipment and the celebrity Froggy Doo. Later the perpetrators sent a ransom note for $150 plus $10 in quarters. Mistake! This action brought in the Sheriff’s Department and the FBI due to extortion. A few days after Froggy was stolen, a boy who was riding his horse on the outskirts of Billings found Froggy’s body hanging on a fencepost. About a month later, three children spotted Froggy’s head lying on the back seat of a car in an alley in downtown Billings. The kidnapping of Froggy Doo is the basis for a new movie A Plumm Summer. For ten more years Happy Herb and Froggy Doo enjoyed an exciting and successful run. In fact, Froggy received more fan mail than KULR-TV has received in its fifty-year history. Froggy Doo retired along with Herb in 1977, but occasionally Froggy gleefully emerges from his trunk to criticize Herb’s oil paintings and to help with magic shows for children. FroggyDoo.com ©2008-2012. All Rights Reserved.